He’s already en route, and will be in Pittsburgh soon. He’s on the GAP. Last check, he was in Paw Paw, WV. We ought to give him a nice warm welcome. With a whole crapton of HealthyRide bikes. He’s somewhere on the C&O. He can’t be more than a day away. Awesome! I’d like to see him roll in! 9:19 a.m. he’s somewhere on the GAP, approaching Pittsburgh. I’m still in McCandless at 10:30. I sure hope someone is in town to meet him! I found the bike locked up next to the Penn Ave bike lane. I admire his chutzpah…however, from what I’ve read, he’s effectively stolen the bike, and that doesn’t seem ok.
Tanenhaus, who has already been slapped with the maximum $1,200 late fee by Citi Bike, quit his job as an event planner and checked the bike out from a dock at East 20th Street and Second Avenue on Aug. 6. On top of all that, he could face prosecution if Citi Bike presses charges. Again, I admire his fortitude; but, if he asked, and they said no, that doesn’t mean it’s cool for him to do it anyway. Public and visible bike theft, in order to get people to contribute to his personal journey of discovery, is still bike theft. Well, so long as the pays the fine, which is basically the cost of the bike, I don’t see the problem. It would have been better if he’d gotten their permission. But it’s not like they’re out any money, right? And they get lots of free publicity. Yeah, maybe a little iffy, but meh, there are more actual stolen bikes in the Citibike system (600) than Pittsburgh has bikes to start with (500). How are they going missing? If it ws my system to be concerned about, I’d worry more about that than this one case. If I don’t lock up or return a HealthyRide bike properly, (a) I start getting fees assessed almost immediately, and (b) there’s a hefty fine if it goes missing. This guy has already handled the (a) and (b) on that front, and is getting the thing serviced regularly. So while technically he’s got a few points against him, this could actually get a lot of good publicity, and do more good than harm. Related: How does this stack up against taking out a HealthyRide bike and riding the MS150 to Erie for three days all told? To @jonawebb, though, the $1,200 fine does not cover the cost of the bike, which is well up into four digits. No, that is not all right. That is theft. *Maybe* paying the owner back later doesn’t make it not theft. It is not “rent with an option to buy”. TBH, I suspect the sole reason that he chose to continue on the CitiBike path, after being turned down, was because he gets far more publicity on one of them than he would if he were riding a Craigslist find. More publicity == more donations via his Website, more people buying him lunch on the way, and more people offering a place to sleep. Call it civil disobedience. He contacted CitiBike, they know his plans, he was denied permission but is doing it openly anyway, and, I’m assuming, is paying all the fines etc. I don’t have a problem with this. What cause is he championing? I think the cause is something about the awesomeness of the CitiBike, and his own awesomeness. But it doesn’t really matter. He’s not sneaking around and stealing bikes, he’s following the rules, except for taking the bike without permission, which he tried to get. Close enough to the civil disobedience model for me. I’m sorry, Jon, but I’m not understanding your argument, unless it’s some variation of “no harm, no foul” (which, given the cost of the bike, does not apply here). In my opinion, asking for permission, not getting it, then doing it anyway, *just because you feel like it*, is not “civil disobedience”…it’s adolescent rebelliousness. I dunno…perhaps I’m misunderstanding the situation. But it seems pretty clear cut: dude asked for permission to use a CitiBike, dude was turned down, dude decided to take a CitiBike anyway, rather than just get another one. I suppose an argument can be made that he’s sticking to the letter of the contract (although defending the bike’s use use outside NYC or NJ might be legally sticky), but he is certainly not using the share bike as it is intended, and he is using it in this way explicitly against the wishes of the owners. I wonder how the folks at Golden Triangle would feel about a similar situation? I met Jeff at PedalPgh. He seems like a good guy and I wish him well, but I think I’m siding with @reddan on this one. He asked for permission to use the bike and was told no. Even if in the end citibike changes their mind when they realize how much free publicity they will be getting over the next few months, taking the bike was wrong. What if someone wanted to take one of these bikes and display it in their store to show how hip they are. Do you think paying just the fine (not the cost of the bike) would make it ok? Or how about a NY billionaire who hates bike lanes so he checks out all of the bikes and doesn’t return them? I see both sides’ pros and cons; you/we’re both right. I’m still more worried about the losses of several hundred rolling stock. At probably $5K/bike, that’s three million dollars down the hole. How or why isn’t that being looked into a lot more seriously than someone demonstrating awesomeness … albeit with a tinge of ah-screw-it mixed in. In one of his blog posts, he says he was ready to fork over five times the cost of the fines, which does put it in the range of what the replacement cost of the bike would be. Then again, thpppft, five grand vs three million. We’re arguing about the wrong thing here. Do you actually know that the CitiBike organization is ambivalent about losing a few million dollars worth of bikes, or are you just speculating? Whatever the answer to that question may be, this entitled clown is simply violating someone else’s property rights for his own self-aggrandizement. I’m assuming he’ll return the bike, or somehow make amends. I agree that if he just took the bike off on an adventure with no intention of making things right that’s not cool. But if he returns it and pays the fines, or pays for it outright, I think the benefits to CitiBike outweigh the harm and they should have negotiated with him in the first place. I think the benefits to CitiBike outweigh the harm and they should have negotiated with him in the first place. I think that’s probably the fundamental point of disagreement here…they *did* discuss it with him, and the two parties were not able to reach agreement. “You wouldn’t give me what I asked for nicely, so I’ll just take it” is not a sound mode of behavior. Here’s an interesting question: if he is involved in some form of accident, what’s CitiBike’s liability? There is precedent for liability on the part of the owner of a rental vehicle, if the equipment is somehow faulty (say, inadequate brakes, for example), or if they “negligently” rented to a driver who was unsuitable. Now, I strongly doubt that anyone in their right mind would hold CitiBike responsible for harm in this case, but, if someone else is injured, CitiBike could very easily be named as defendants, and have to face expensive litigation. Given that they, as an organization, have far more assets floating around than Jeff is likely to have, they’d be an attractive target in a civil suit. Also, to be honest, supporting this kind of behavior is a good way to move share-bikes out of reach for the urban poor. If people can walk away with a $5000 bike for $1200, the logical response of the organization is to require sufficient available credit in the user’s account to pay the replacement cost of the bike. While it’s not hard for your average middle class wage slave or college student to have several $K free on their credit card, that is NOT the case for a whole lot of other people. I’ve probably blathered on about this topic enough, come to think of it. $1200 does seem like a high price — you can get a really good utility bike for that price, retail. I’d bet that CitiBike recovers most of their cost of the loss of one of the bikes once they get paid the $1200 fine. Have to give him respect. He’s still out there, and now it’s getting cold. Or how about a NY billionaire who hates bike lanes so he checks out all of the bikes and doesn’t return them? Dammit, I TOLD you not to mention Citibikes to Trump. He sent me a tweet just a couple of days ago, snowbound in Williams AZ. Click below to see the whole four-tweet conversation, with a photo of his rig in the snow. @bus15237 Hey Stuart! Good times in Pittsburgh this summer and now it's full-on winter in Arizona. Snowed again last night! Any time someone rides across the country, it is interesting and a mammoth achievement. I hope the situation is resolved, with all sides “saving face” upon his return. It would be interesting to know how many miles any other bike in their fleet has traveled in the time he has had this one. The manufacturer would surely be interested in how well the bike has fared over several thousand miles. When Brock Yates and a couple other writers for Car and Driver magazine did “One Lap of America” in 1974, exploring how well the new national 55 mph speed limit was being adhered to, they put something like 10,000 miles on a new Mercedes in a couple of weeks. It was great publicity for everyone. Ditto the “cannonball run” undercover races from NYC to LA at about the same time by roughly the same people. Stu, on the same note. Burley should be all over this. A lot of touring blogs poo poo the Travoy touring trailer. He’s been using it with great success. He’s taking his time now that he’s reaching the end. He’s near San Beranardino now. About 70 miles from the coast. Planning to reach the Santa Monica pier 1/23. Here is his blog. http://www.countribike.com/ I reached out to Burley. They have been helping him along the way with any troubles he has had with his trailer. Wild story about him getting punched in the face. Turns out the assailant was on a rampage and was already in jail b4 Jeffrey identified him. 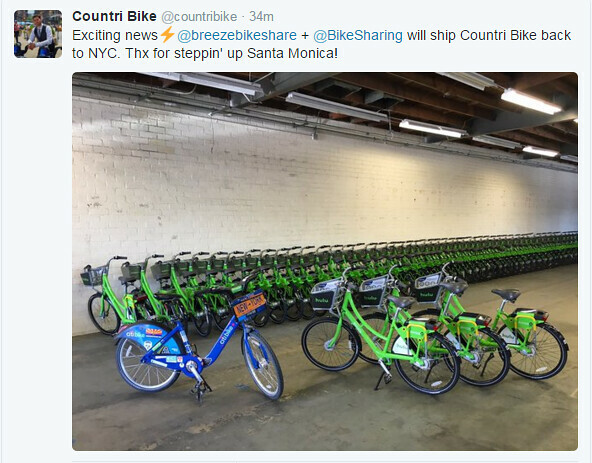 Text of tweet: Ironic ending: while @citibike is frozen in place CountriBike will roll to the sand and sea in Santa Monica in 12 hours. CitiBike’s tweet text: Hey CitiBike Riders! Due to heavy snow in the forecast, we will temporarily close the CitiBike system starting at 11:00PM tonight, Friday, January 22. I still hope he gives the bike back. But he’s put stickers on it and I doubt he will now. He’s shipping the bike back! What else this guy has done as he’s crossed the country is raise the visibility of every city bike share system he’s come across. Yeah, he’s outside the realm of acceptability on one hand, but on the other, the awesome level as he’s gone along has done wonders for talking up the various systems. He spent a lot of time in and around Santa Monica, generating a lot of free publicity for its Hulu-sponsored system, so it doesn’t surprise me they’re footing the bill to send the bike back. A couple hundred bucks well spent, in someone’s book.